Spending a wonderful vacation in Branson, Missouri is a great time to experience as you will definitely enjoy tons of exciting attractions, world-class entertainment shows, interesting museums, theme parks, and great shopping and dining opportunities. With numerous entertaining Branson shows and special events happening daily in the entertainment district in Branson, you are sure to forget for awhile what you have left behind back home. Dubbed as the “Live Show Capital of the World’’, Branson has everything to entertain and amuse every visitor. Branson has tons of entertainers that will astound audiences with their extraordinary performances in many theaters. Some of these amazing Branson shows where great entertainers show their extraordinary talents are the Acrobats of China performing at Yakov Smirnoff Theater, Amazing Pets performing at Grand Country Music Hall, and Dublin’s Irish Tenors and The Celtic Ladies performing at King’s Castle Theater. The “Acrobats of China’’ features daring acrobats from China with stunning and breathtaking acts to the Branson stage. Known for their daring feats and colorful costumes, as well as their amazing renditions of classic Chinese dance and human performance art, this Jinan Troupe is considered the most talented and highly awarded Chinese acrobatic troupe. This incredible dance troupe from China was brought to Branson by Mr. Lizhi Zhao who first introduced Chinese acrobatics to Branson with distinct presentation, costuming, and unique performance style. The “Acrobats of China’’ features more than a dozen stunning acrobats who have performed successfully in many parts of the world. Their edge-of-your-seat entertaining performance abounds with energy, stunning beauty, and heart-pounding experience. Another beautiful show with circus-like acts is the “Amazing Pets’’ that has impressive cast of creatures. Cuddly canines, huggable cats and even brilliantly colored exotic birds are sure to amaze kids of all ages. 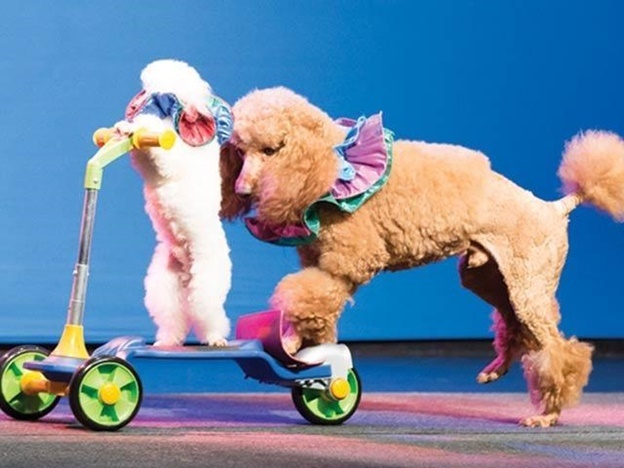 The animal trainer of these amazing pets, Valery Tsoraev has performed with the famous Cole Bros. Circus of the Stars, and was featured with his incredible cats in the Big Fish movie. Valery has cared for these amazing animals including some cats that have simply wandered into his life, and taught them how to perform in a circus. Performing at King’s Castle Theater, “Dublin’s Irish Tenors and The Celtic Ladies’’ are some of the best performers that ever hailed from Ireland. This entertaining show unites two exceptional groups of artists, four beautiful ladies with exquisite voices and five finest tenors all from Ireland. These two groups of Irish entertainers perform some of the very best music of the 20th century, including pop music, opera, and swing, as well as famous Irish classics. Audiences are sure to enjoy their performance with classical music, adult contemporary hits, and those traditional folk ballads that only Irish arts can deliver with such passion. The incredible voices of these two groups will have you sing the night away as they beautifully perform in front of you. In Branson, you are sure to enjoy your vacation as you watch world-class entertainment shows with great performances of over 50 amazing entertainers that you’ll definitely adore.